CALUMET -- Galeries, shops and cafés will welcome visitors for a special Holiday First Friday on Dec. 4. Don't miss this chance to admire and/or purchase hand-crafted gifts for the important people on your holiday list. 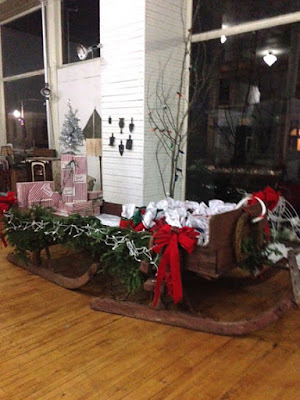 For the kids, start your art tour early at 220 6th St. because Santa will be at the Vertin Gallery from 5 p.m. to 7 p.m. on Friday, Dec. 4, and from 11 a.m. to 1 p.m. on Saturday, Dec. 5. He is waiting to hear Christmas wishes and will have a free stocking full of goodies for each child! 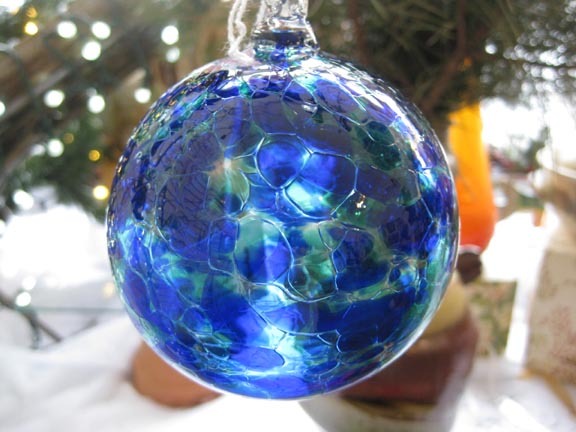 Vertin Gallery Art and Antiques: "I'll Be Home For Christmas"
The public is invited to the Vertin's reception for the exhibit "I'll Be Home For Christmas" from 6 p.m. to 9 p.m. on Friday. Featured artist of the month is Kate Langdon, watercolor artist. Special musical guest jazz guitarist Mike Irish will perform. Featured artists include metal sculptures and natural photography by Dave Walli, watercolor reflections from artist Clarence Fisher, and jewelry by Pam Hecht and Gustavo Bourdieu. 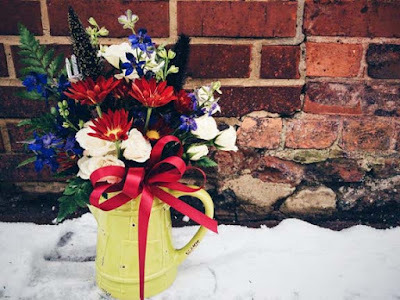 Holiday centerpieces, antiques, jewelry, vintage clothes, and gifts from local artists and collectors are featured -- including vintage, modern, industrial chic, mid-century modern and classic retail items available for the style-minded shopper. Gift wrap, refreshments, drawings and very special sales are waiting for you in traditional holiday style for a memorable Christmas shopping experience. The Vertin also offers extended holiday shopping hours: Monday, Tuesday and Thursday noon to 6 p.m. and Friday and Saturday 11 a.m. - 6 p.m.
Calumet Floral and Gifts, 221 Fifth St., invites you to their First Ever Holiday Open House Extravaganza! From 6 p.m. to 9 p.m. on First Friday, Dec. 4, they will help you plan a special custom holiday gift or decoration to match your theme and style. This can be a Gift for the Table: a fresh arrangement, centerpiece or gift basket. 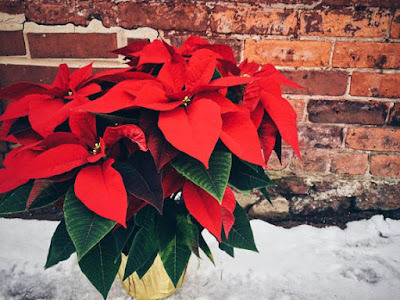 Or it can be a Gift for the Season: a fresh evergreen wreath, a poinsettia or a seasonal permanent arrangement. Enjoy refreshments and inspiration as you walk through this Christmas-themed Wonderland! It’s that time of year again to start looking for the perfect Christmas gift. Visit the Paige Wiard Gallery, 109 5th St., for the Glorious Gifting Show. The gallery will be displaying unique gifts, with a variety of price ranges. Stop in to find the perfect gift for everybody on your list. An opening reception will be held from 6 p.m. to 9 p.m. on Dec. 4. For more information please call 337-5970 or email paigewiardgallery@gmail.com. Stop in at Hahn Hammered Copper, 203 5th St., this First Friday. Peter and Shelly Hahn offer their own hand-hammered copper ornaments, unique re-purposed items and architectural findings. See also their pins hand crafted from vintage fur, Pewabic style clay tiles, spicy soaps, Mokume Gane rings, vintage copper jewelry, military surplus shoulder bags, and many more unique and unusual items. Stop in Friday evening for goodies and a chance to win a Keweenaw canvas print. 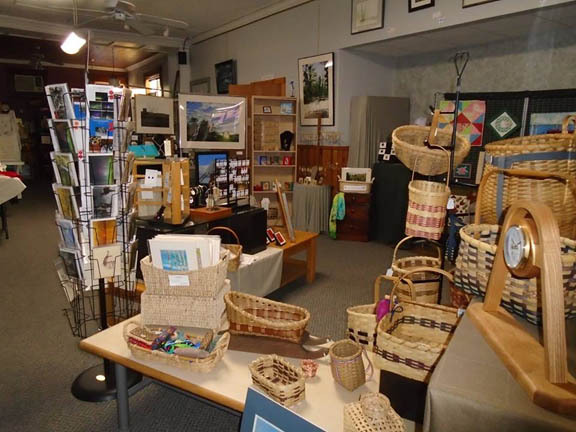 The Calumet Art Center offers many artistic creations for sale this First Friday. 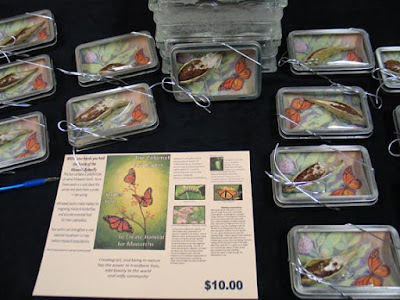 Beautiful boxes containing milkweed seed are the perfect gift for anyone proactive on renewing habitat for monarch butterflies. You can find potted houseplants, hyper-tufa pots planted with winter-hardy hens-and-chicks, copper jewelry, mug gift sets, ornaments, Jikiwe pottery, note cards, woodcuts, twined rugs, beautiful tote bags made of recycled upholstery fabrics and hand-dyed scarves. A recent inheritance given to the Art Center is an enormous collection of quality costume jewelry which will be for sale. Remember, if you shop at Econo Foods in Houghton, please bring your receipts to the Art Center. The 50/50 Raffle Bowl is filling with tickets and the drawing will be Friday at 8 p.m. Tickets are $1 each or 6 for $5. 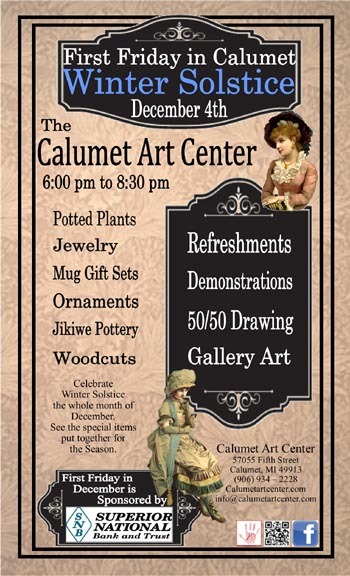 Please swing by the Calumet Art Center at 57055 Fifth Street and enjoy winter refreshments, art demonstrations, and gallery art. Cross Country Sports, 507 Oak Street, will hold a Holiday Open House from 6 p.m. to 9 p.m. Friday, Dec. 4. Taste some holiday cookies and refreshments while shopping for unique gifts in a warm and inviting downtown setting! For the month of December, Cross Country Sports is featuring new works by eight artists: Metal prints and 2016 calendars by Jeremy Rowe, Night Sky Photography; jewelry by Annele Sakari of Hello Starling Designs; enameled copper jewelry by Heather Mroz; nature-inspired jewelry by Jackie Ellenich, Designs by Jak; new water color prints and cards by Barbara Flanagin, Amorosi Artworks; jewelry and cards by Nina Ollis; and pottery by Elaine Eikenberry and Jess Kane. Clyde Mikkola will be curating the Galerie Boheme, 423 Fifth Street, for the First Friday show in December. He will be featuring several artists including Fredi Taddeucci, Bob Dawson and multi-media artist Deidre Yseult. The Galerie will be open from 6:30 p.m. to 9 p.m. and is generally open on Saturdays. The Omphale Gallery and Eagle Café, 431 Fifth St., will exhibit new art by j.d. slack and will provide music from the LP Lounge, featuring artists like Glenn Miller from the "Big Band Era" to the Beach Boys from the Pop/Rock genre this Friday, Dec. 4. You can even bring your own vinyl. Chicken pasta penne will be the featured menu item. The Omphale Gallery and Eagle Café will be open from 6 p.m. - 9 p.m. on First Friday. Copper Country Associated Artists Gallery (CCAA) will celebrate the holiday season with their annual Open House this First Friday. Enjoy treats and Good Company. Check out what's new at the co-operative gallery. Many gift items are available including fabric arts, basketry, paintings, jewelry, photography, pottery, and even some music boxes and clocks. New glass by Nancy McCabe is also featured. You might just find that special gift for that special someone. The CCAA Gallery will also be open from 11 a.m. to 4 p.m. on Saturday, Dec. 5. Café Rosetta, 104 5th St., will feature new art and poetry readings/open mic, from 6:30 p.m.-7:30 p.m. on first Friday of every month. A local favorite, Marne Anderson, is featuring handmade winter-themed wool appliqué quilts. Her freehand style features children in bright folksy colors. Café Rosetta is also exhibiting Finnish cedar baskets by Dennis Keranen. Using a 100-year-old family tradition, he uses frozen cedar strips to create by hand, beautiful, durable and functional baskets available in many sizes, in stock or made to order. Enjoy the pieces on display or call 337-5904 to learn more. Keweenaw Coffee Works, 326 Fifth St. will be open from 6 p.m. - 8 p.m. on First Friday, with refreshments and samples. Ugly Sweater Parties will take place here on two Saturdays, Dec. 5 and 19, with prizes for the BEST Sweaters. For more information call 906-337-6220 or check out the website at www.keweenawcoffeeworks.com.